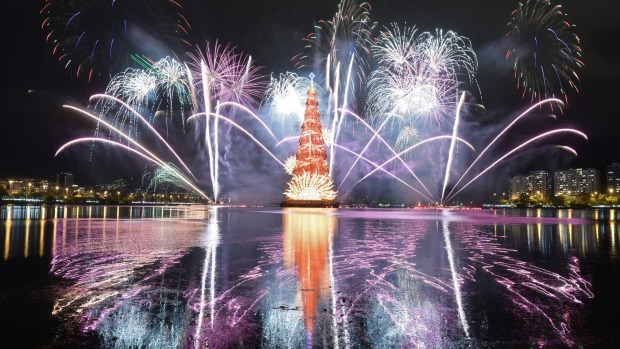 The largest floating Christmas tree in the world returned this Saturday to shine in Rio de Janeiro, accompanied by a pyrotechnic spectacle and amid a great expectation after two years of absence. The tree, a metal structure 70 meters high and composed of 900 thousand led bulbs, was lit on Saturday on Rodrigo de Freitas Lagoon, in the southern region of Rio de Janeiro. The last time this happened was in 2015, a year in which a strong wind broke a week before the opening and forced to reduce its height from the traditional 85 meters to just over 50. The opening ceremony, attended by hundreds of people, had a fireworks display that lasted seven long minutes. The tree will be lit every night until January 6, during which cultural activities will take place in the surroundings, such as concerts, different Christmas decorations and a place to take photographs. Santa will also be present, though only on weekends. According to Rio’s City Hall, Rio’s floating tree, the largest of its kind in the world, according to the Guinness Book of Records, usually has 200,000 visitors over the Christmas holidays.